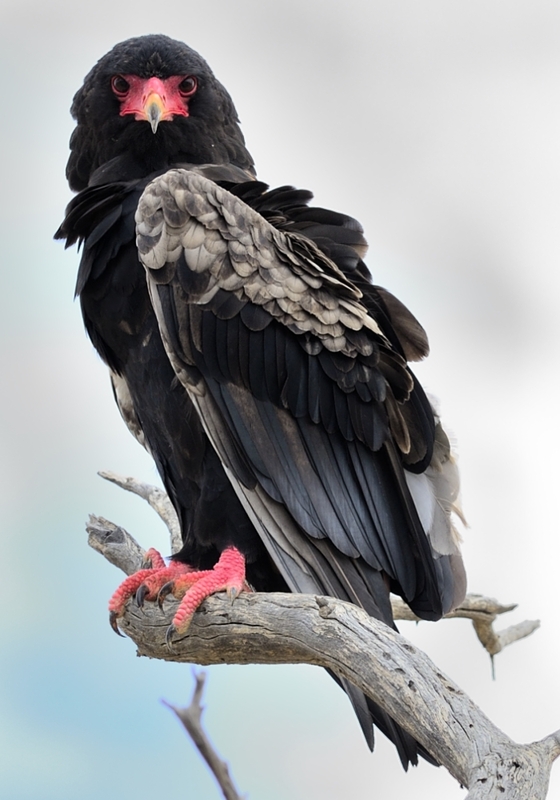 A Black Eagle would be good. But I don’t want to be too fussy. Today is a photo essay of sorts – no need for words. 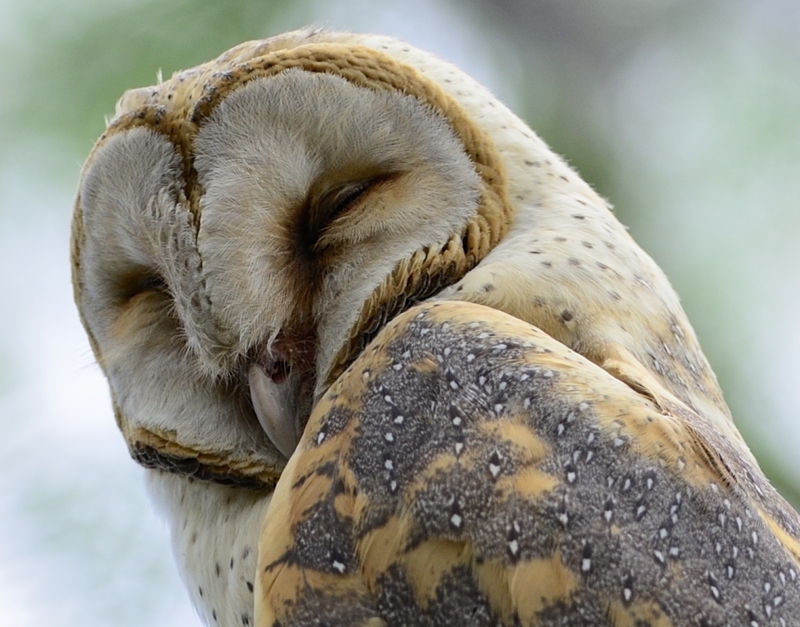 Most birds build a nest for one breeding season only. 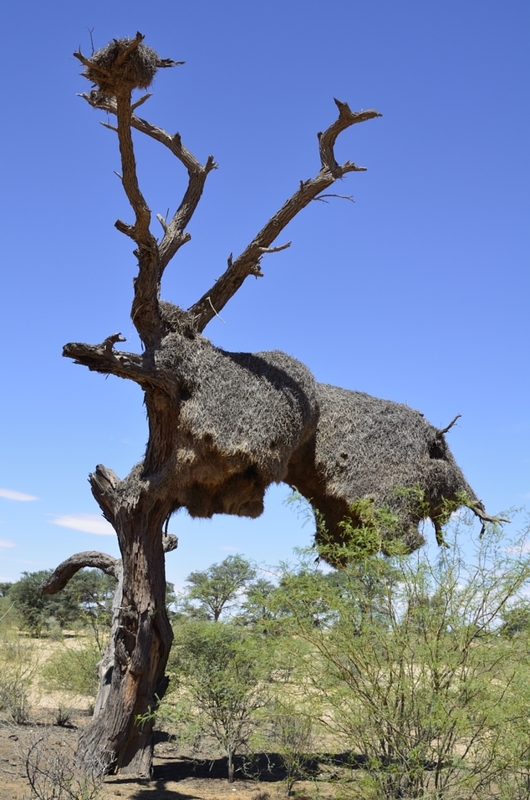 Sociable weavers use and maintain their nests for ages. 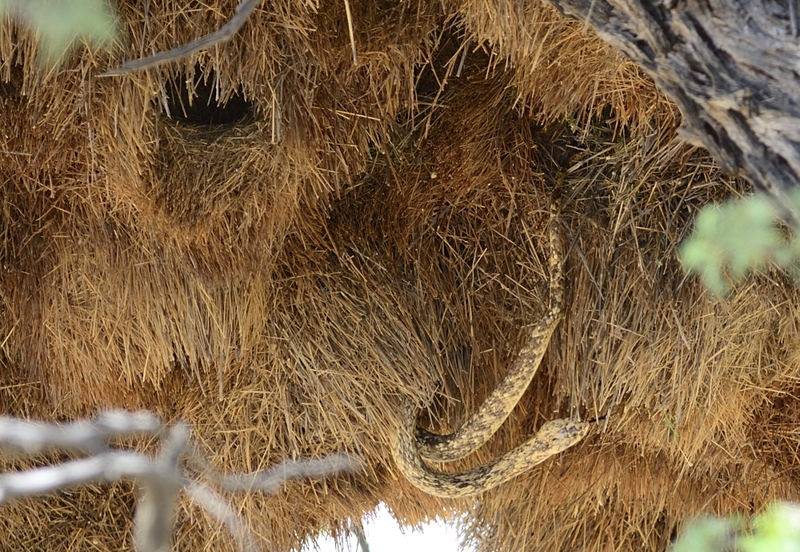 One huge nest is weaved for the entire colony. These giant grassy apartment blocks put up with several hundred noisy, restless tenants all year round. 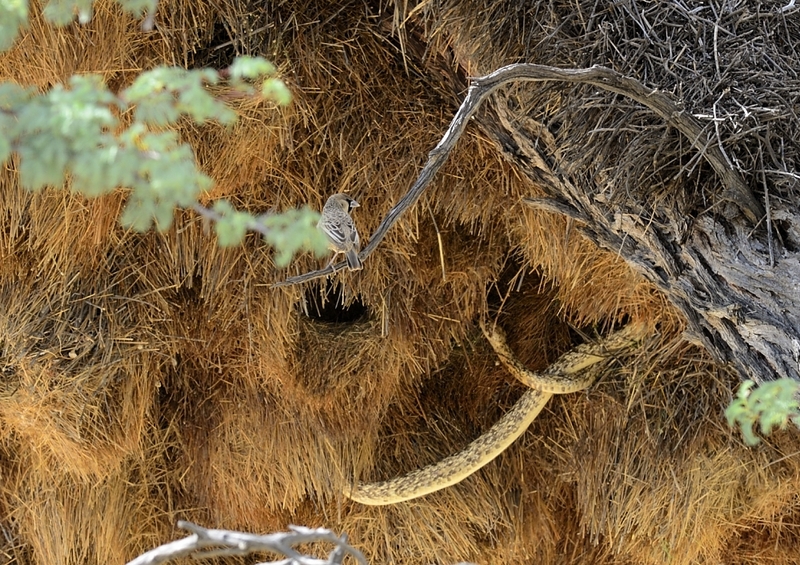 Some nests have been thought to last over a century. 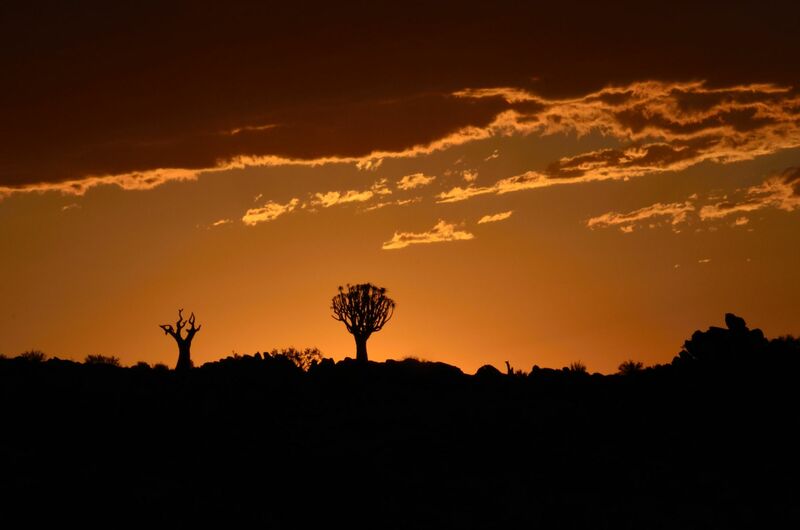 The massive hanging haystacks (that can be up to 4 metres high and 7 metres long) begin to appear as one approaches Upington in the Northern Cape. Telephone poles seem to teeter under the weight of them…some have collapsed and lie dead along road verges. 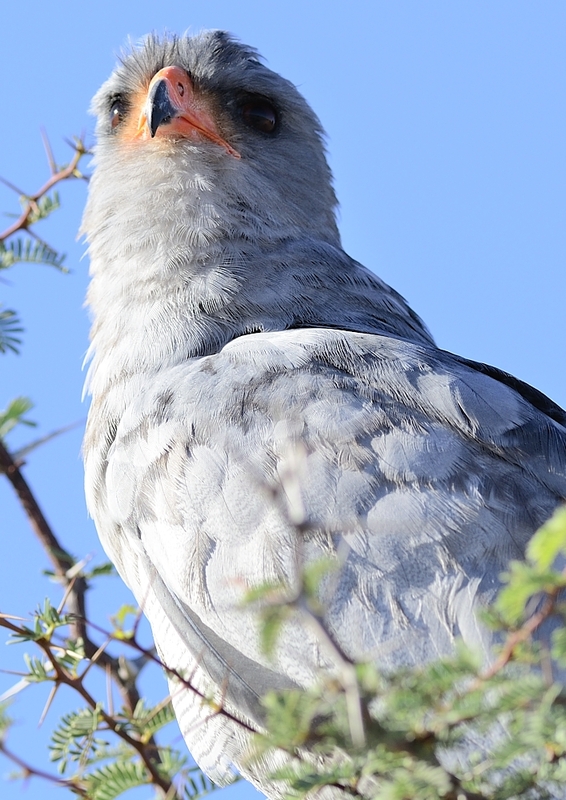 There are often a couple of cheeky non-paying guests at Hotel Weaver….the Pygmy Falcon, chats and finches – many come to enjoy the free, cosy nesting chambers. Some really presumptuous raptors may even consider the nest a handy and convenient platform upon which to roost. 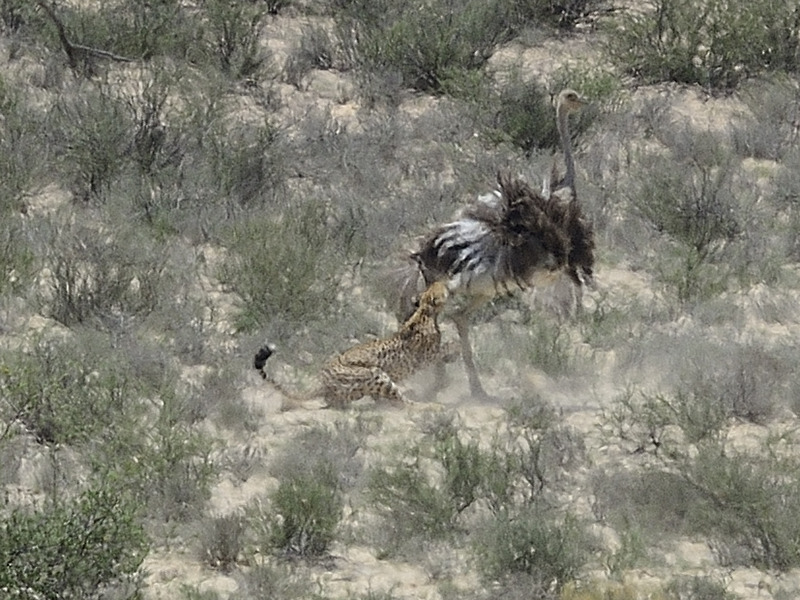 As mentioned in my first post about the Kgalagadi, nature is red in tooth and claw…you see life and death within seconds of each other. This rawness can be disturbing to some. When we excitedly mentioned our cheetah kill sighting to a chap in one of the camps, he said he no longer hangs around to watch them, saying that for him it is a bit like watching a car accident. Each to his own, I guess! The scene below was wonderful to watch. It also had its moments…when we thought the poor little thing was stuck and wasn’t going to make it! Then what could we do? Absolutely nothing, of course. 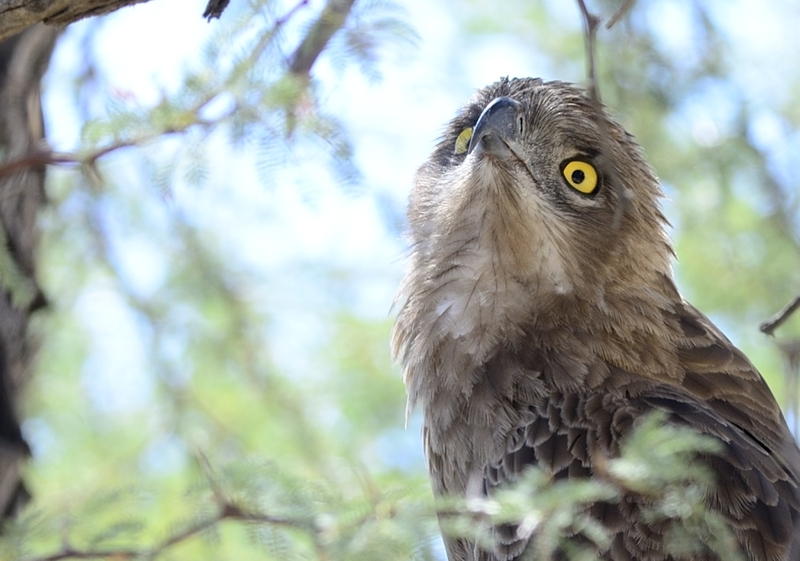 Yet again, we were just casual bystanders – powerless to intervene, but privileged to watch something so extraordinary and to share an incredible hour with this Sringbok mum. 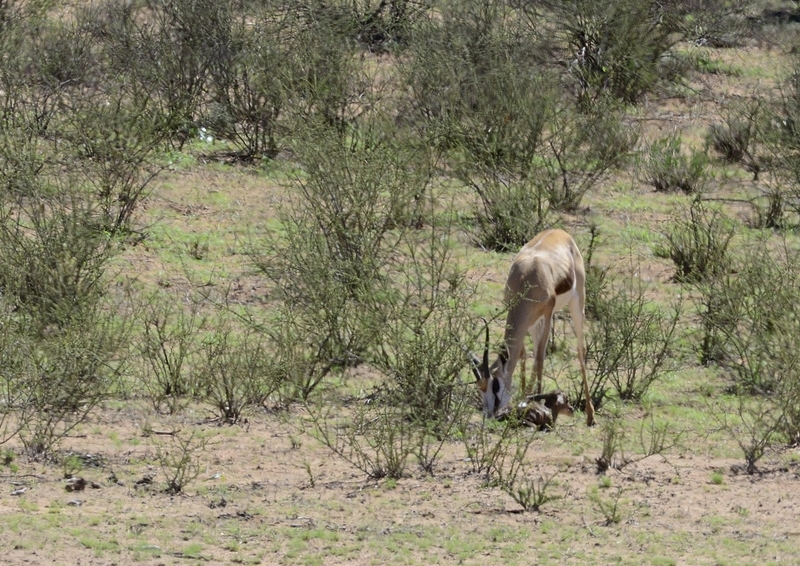 As we drove by, we spotted her lying down and I noticed the birth sac protruding from her. She stood up and moved about and slowly two little feet emerged. She did not seem to be actively pushing – she would graze a little then maybe nose her behind a bit…but was not overly concerned about things. At one point something spooked the small gathering of females and babies and they all bolted across the road -birthing mum included. As she ran, the sack burst and this seemed to speed things along. We then watched the little creature inch its way into the world – ears, nose, eyes. The whole shiny bundle plopped out after a good 45 minutes. 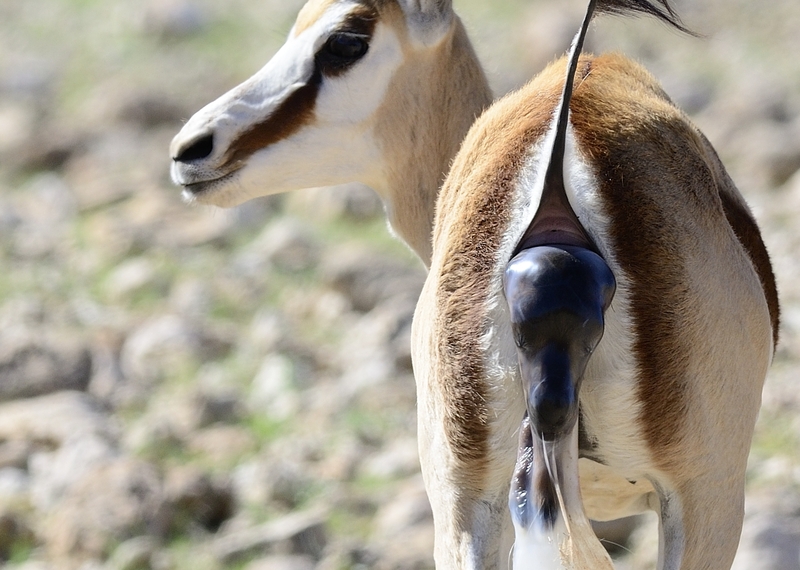 The mum spent a long time licking and eating the placenta and then this incredible little creature made its first attempt at getting up. It struggled for ages, but could never quite make it. We had to leave the scene before we saw it totter up successfully, but were told by people who had seen this before that it can take quite a while. Our concern was that because her birth had seemed so prolonged, perhaps something had happened to the calf? 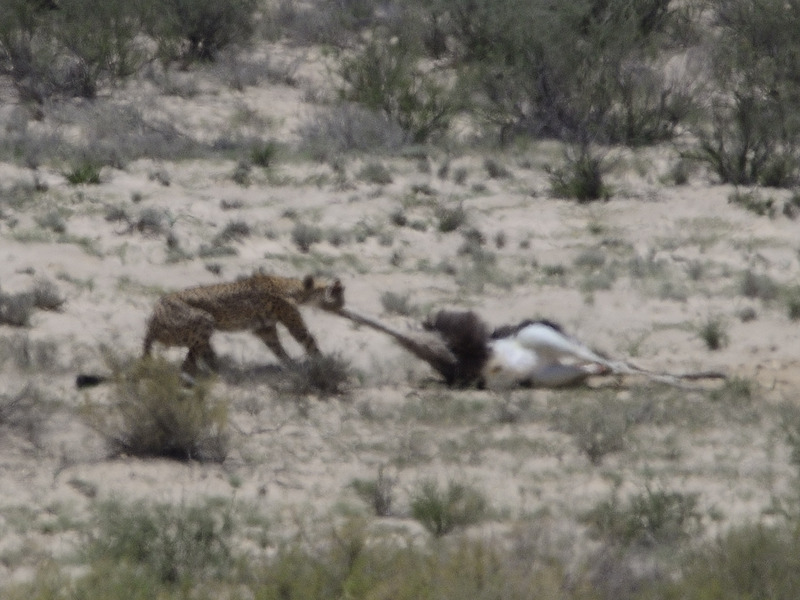 Again, like the cheetah and her kill – we will never know! And whatever happened, there would be no waste, if the little thing was damaged in some way. 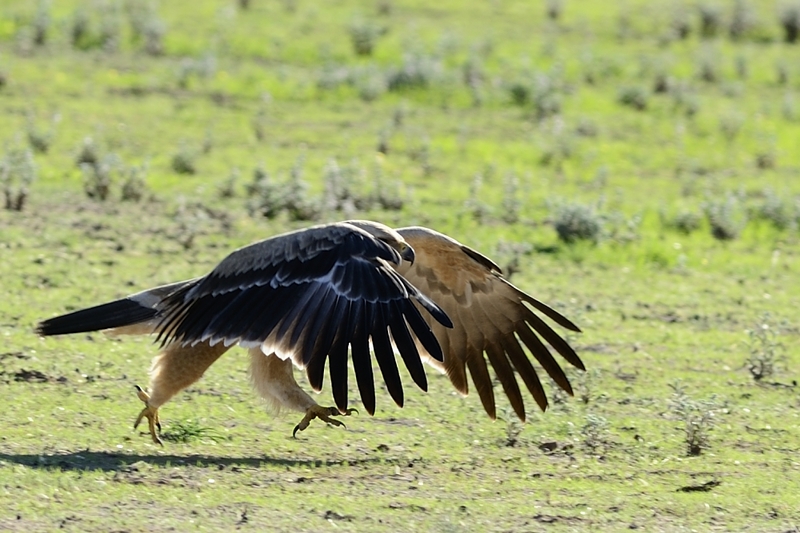 Someone would have benefited from this gift of life – hyena, jackal or vulture. 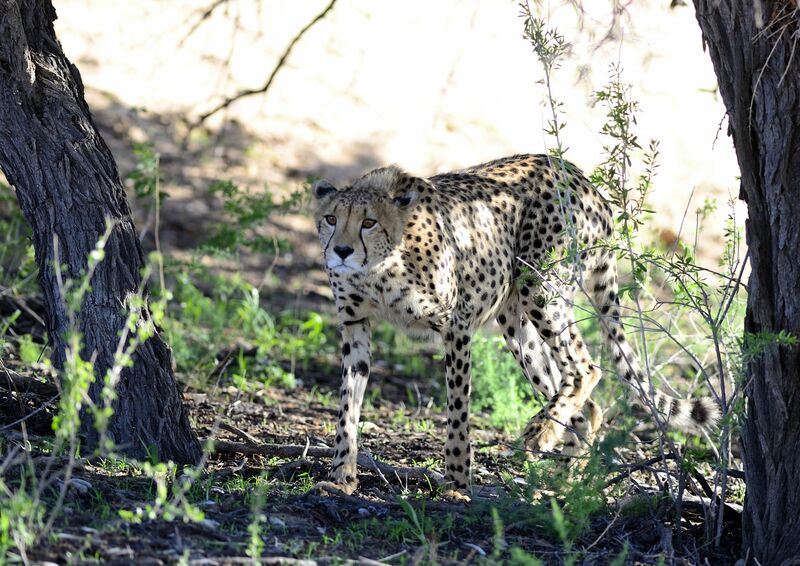 Sometime after midday on the Nossob River side of the park, we spotted a lone cheetah under a tree – well over a kilometre away from us. She was in the shade of a large acacia doing what these big cats do best – lounging about, full of feline disdain and attitude. 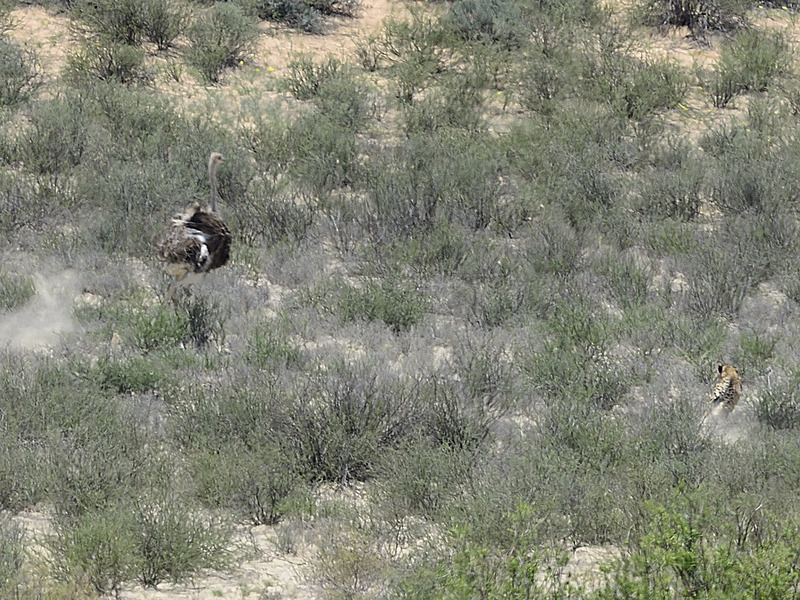 I scanned up and down the river bed with my bins (to check for hapless prey material, just in case) and lo and behold spotted three mature ostriches trotting south directly towards her (a male with two females in tow). The 7 ½ yr old had spoken! And given his astonishingly accurate assessment of so many other behavioural issues in the preceding days, we took his word for it and accepted that she would be wise and just watch them trot by. She suddenly adopted that classic feline crouch, her head and ears flattened, shoulder blades up. The tension and electricity in our car was incredible as we realised it was all going to happen – and fast. 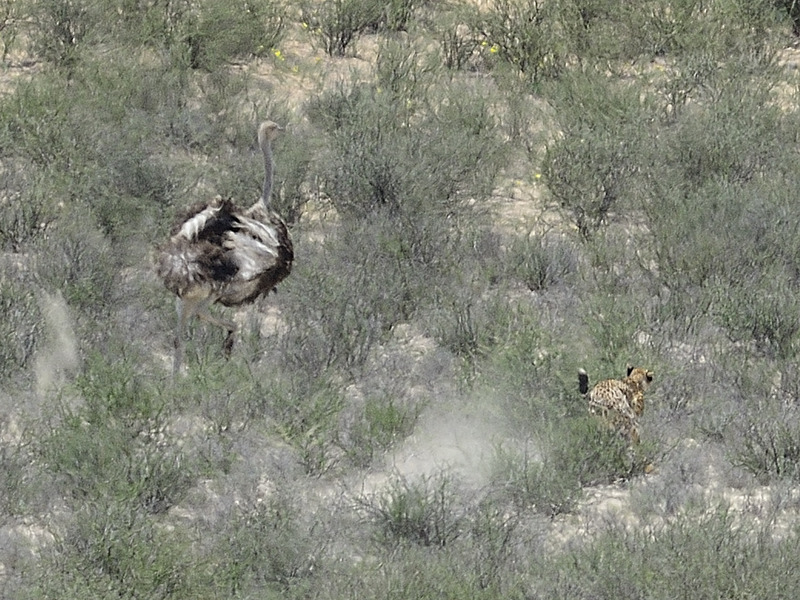 The large male ostrich trotted past and then VOOMP –she leapt. She was incredible…with precision and control and the most phenomenal speed, she bolted towards the middle bird from the side. The birds all panicked and it was knees up as they attempted to flee – tail feathers splayed and aloft. We watched and tried to makes sense of the blur of her supremely athletic body, her stealth and missile-like focus. 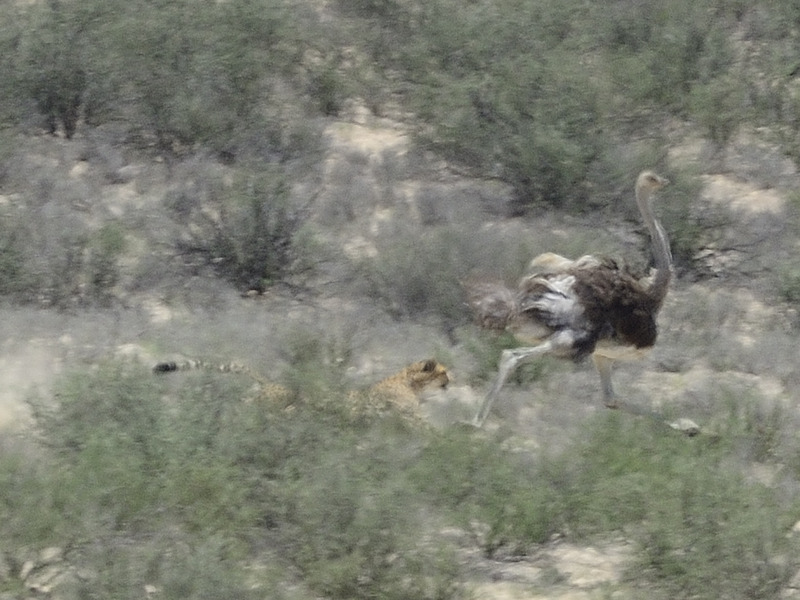 She veered right, then left, and then leapt up, grabbed one of the ostrich’s massive thighs with her paws and the neck with her jaws and after about 15 seconds the bird was down. 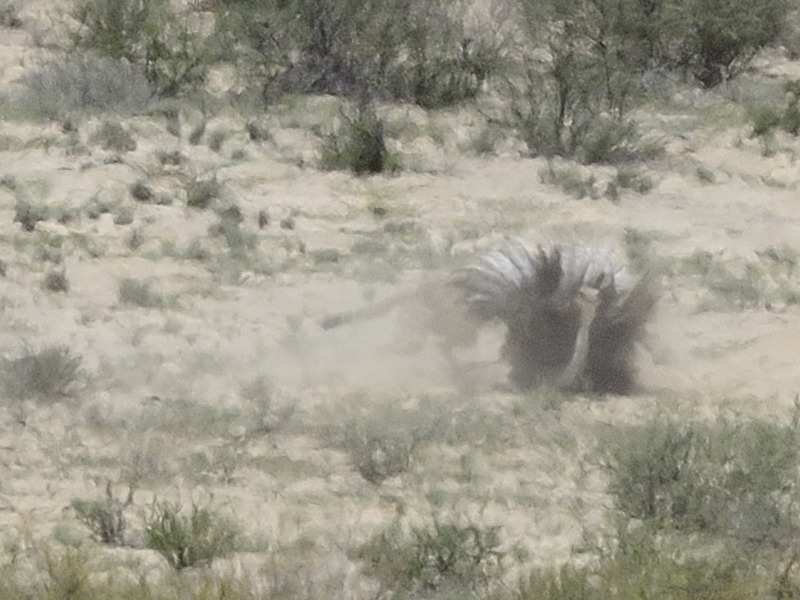 There was an explosion of dust and a 30 second long struggle on the ground with dangerous thrashing legs, a flurry of wings and flaying neck. 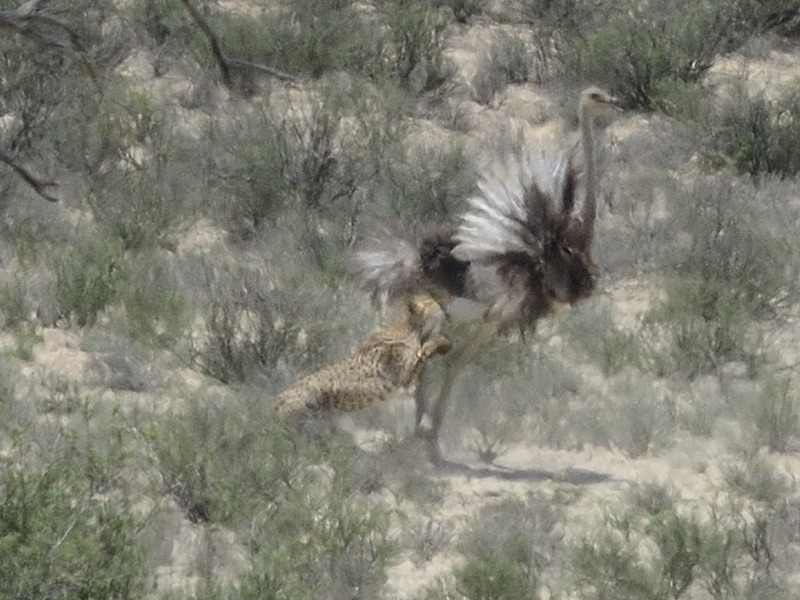 We then watched the cheetah drag the bird by the head for about a metre and then drop it. She walked back to the shade of the tree (no hint of injury or damage) and flopped down. It was probably about 35 degrees at that point. She had just brought down (and dragged) an animal well over twice her weight and well over four times her height, and was no doubt shattered. We waited for just under an hour – watching to see if she would start feeding, but she didn’t. A day later we drove to the same spot and the only hint of the previous day’s carnage was a small pile of damp feathers and a few bones….whether she had eventually feasted on her prize (or possibly other scavengers in the night had enjoyed her winnings), we will never know! When it was all over we all sat and looked at one another. I was shaking, Tim drained a 2 litre bottle of water and Warren just kept saying F#%ck. It was quite the most incredible thing to watch. Here is the sequence. I apologise for the number of pictures, but I couldn’t resist. 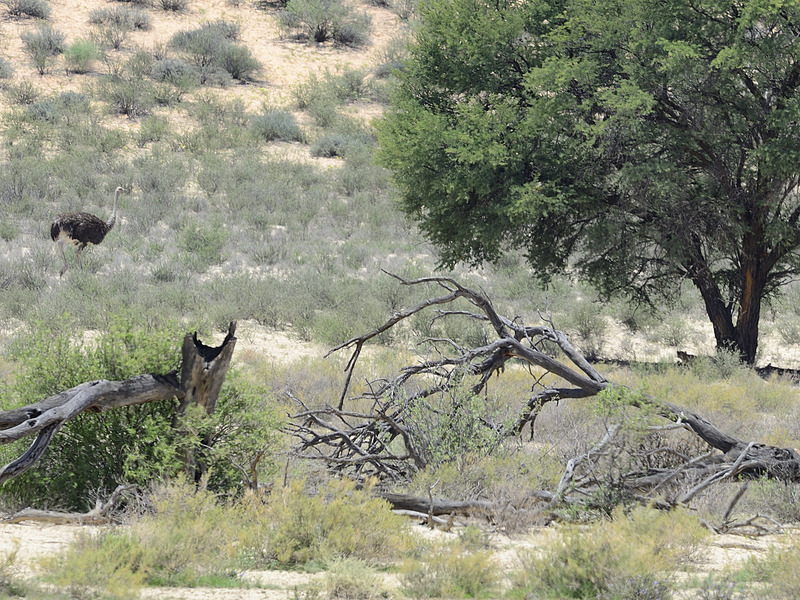 We are back from an incredible trip to Augrabies and the Kgalagadi. It was very difficult to point our car south and head homewards on Saturday morning. That sand, the colours, smells, sounds, the searing heat and all that brilliant LIFE! It all gets under your skin so. The place is teeming at every level. On the ground, below the ground, in the trees, and up in the air. 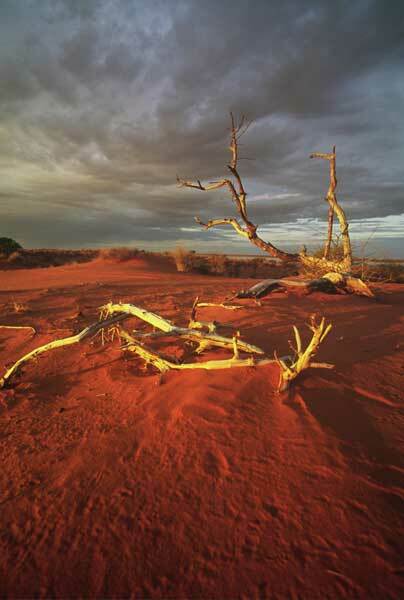 We missed the worst of the flooding that now has Augrabies and surrounds under siege. We saw the falls at their very best. The water was boiling, but certainly not as demented as it is now. What I love about the theatre of the bush is that everything is so raw and so vital. New life emerges, and the next second it is swiftly taken away. There is no mercy and very little dignity. One becomes so aware of just how tenuous it is to be anything below the top level in the food chain – every second of every day is about watching your back (between finding food and procreating). It is really that simple. Rain has blessed the area recently and the usually parched river beds have a carpet of life-giving greenery. We had one glorious thunderstorm in the early evening, with the kind of lightning and thunder that you only ever get in the bush. It was the curtain call to a long night of rain – about an inch of it. The next morning the river beds were dotted with pools and boggy patches – for all of about 3 hours, only to be sucked deep into the earth. 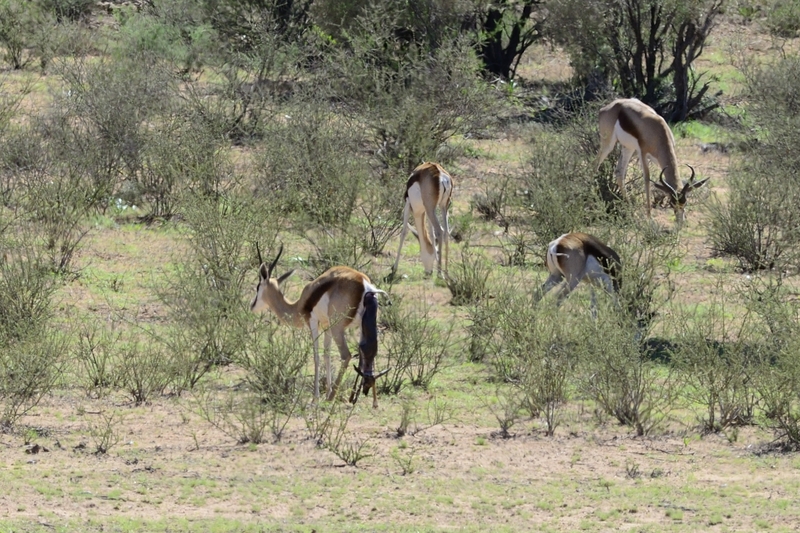 The state of the veld is perfectly reflected in the glistening health of all the animals. 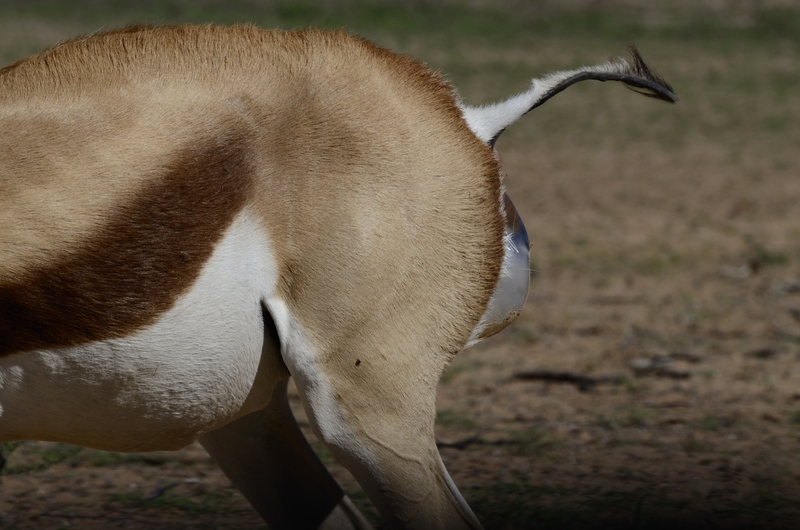 The springbok, gemsbok and hartebeests’ flanks are sleek and taut, the cats all have gleaming coats, heavy bellies and satisfied smiles, and the ground squirrels just charge about with their furry parasol tails gobbling up new shoots – they are the real comics of the bush. Back on the 17th with many a tale to tell, no doubt. My son got a snake for Christmas. Yip! 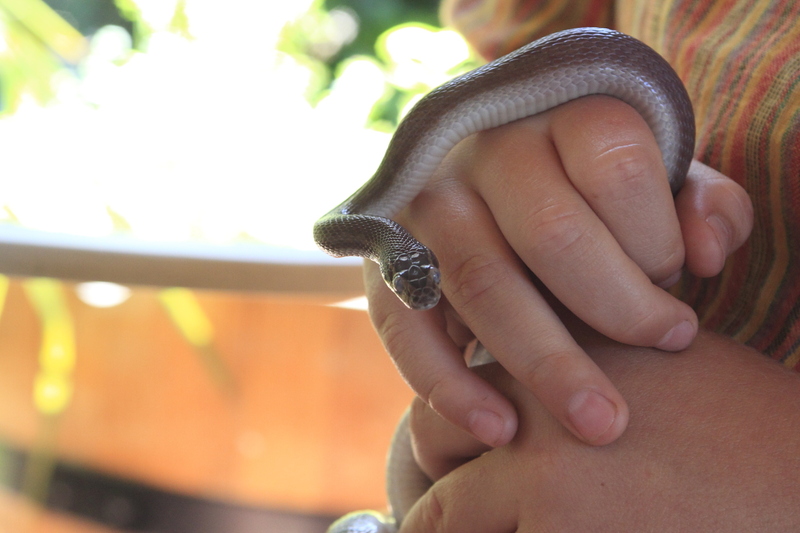 Santa very kindly slipped a beautiful, sleek Brown House Snake into his stocking at the last minute (along with a custom built cage, frozen food for 6 months, bedding, and a transit permit from Cape Nature, etc etc). “Only the best food for OUR snakes”, she tells me…and we have a big, well designed cage built specially for the little guy. His name is Luke. After Luke Skywalker – of Star Wars fame. This creature is glorious in every way. They really are magnificent animals. In the two weeks we have had Luke he has shed his skin. 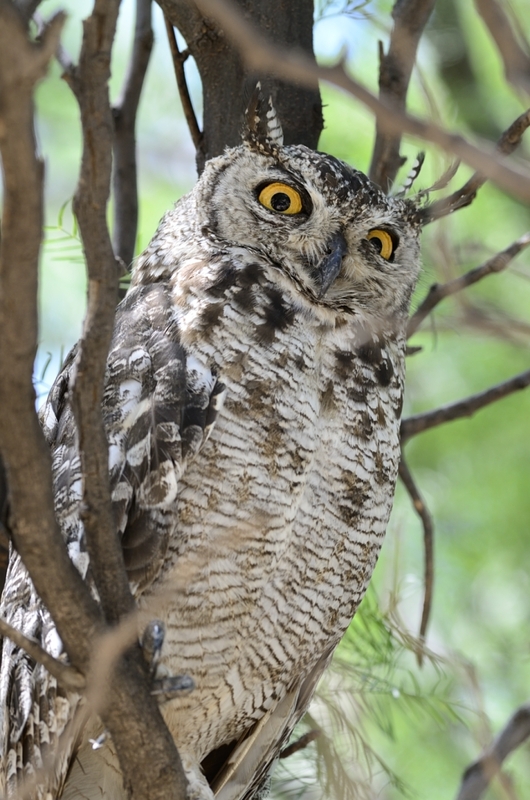 See his very opaque eyes in this picture – these are classic pre-shedding eyes. He has had one good feed (more of that another day), and done all the things a healthy snake should do. He gets ‘played with’ fairly often. Tim is amazing with him – there is huge respect and gentleness there, which we insist on. What I am enjoying is the fact that as friends pass through, Tim brings Luke into the scene. Initial horror is replaced with cautious touching, then even holding, then comments ‘Wow, he is so soft and beautiful’…. The young and the old, that is. These are people who have been alienated all their lives and are now seeing these animals for what they are. For the most part -harmless, when not confronted or threatened, beautiful, and NOT slimy or revolting. They are also incredible to just observe closely. I love the fact that my son is so comfortable with snakes and relish the notion that he will go on to handle, appreciate and understand many different kinds of snakes in his life. Safely, of course….